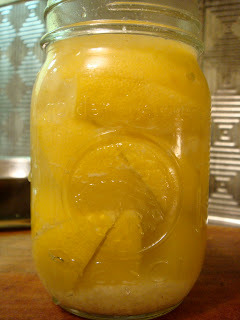 It has taken awhile but, here is my recipe for my most favoritest condiment, preserved lemons. These are lovely sliced and wok sautéed with garlic and gai lan, or other leafy green. It makes an excellent addition to a salad dressing, and brightens up soups and stews. Baked with chicken, it provides a high contrast element to earthy olive oil, garlic and herbs. Note; it is imperative you rinse your lemons well before adding to your dish. Ingredients: 7 Lemons, ½ C. salt (approx). Scrub skins of 4 lemons, cut ends. Slice into eighths, almost all the way through, keeping lemon intact. Sprinkle liberally with coarse salt. Pack into 250ml mason jar. Add juice to jar, to top, leaving little room for air. Add scant teaspoon of salt, close lid tightly. Leave on counter for 2 days, turning often. Refrigerate for one month, turning each day. How would you describe how these taste? The flavor of these I find is a deeper citrus than a fresh citrus. It's more akin to the rind I suppose. I have found they have a bitterness and are savoury, pairing well with rosemary, dark leafy greens, or hearty stews (add at the end). The flavor is intense so only a small amount need be used, otherwise you may find your dish too salty or too bitter. They are used quite a bit in Moroccan cooking as well though, which incorporates raisins, nuts and other sweet foods.